Keep your baby comfortable and dry at all times with Quick Dry Baby Bed protector. This bed protector is breathable, reusable and washable and comes with an 'OEKO Tex Standard Certification'. Its water-proof membrane ensures zero seepage. This mat protects the mattresses without compromising on the babies' comfort and makes zero crinkly sounds. It ensures that your baby gets a clean, dry and healthy sleeping environment. It also protects your baby against dust mites, bacteria and allergens and is the best alternative for the unhygienic, non-absorbent rubber sheets that cause heat rashes and perspiration. About the Brand: Quick Dry is a revolutionary and unique product that has been created by Shiva Texyarn Limited in early 1990's for the first time in South East Asia, adhering to international quality and safety standards. 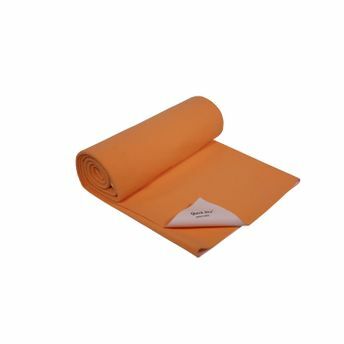 It protects against dust mites, bacteria and allergens and is the best solution for the unhygienic, non-absorbent rubber sheets that cause heat rashes and perspiration. Quick Dry is ideal as a play or changing mat for babies, toilet-training toddlers as well as pregnant and new moms apart from adults/bedridden patients with urinary incontinence. Explore the entire range of Baby Bedding available on Nykaa. Shop more Quick Dry products here.You can browse through the complete world of Quick Dry Baby Bedding .Alternatively, you can also find many more products from the Quick Dry Baby Bed Protector - Plain Peach range.